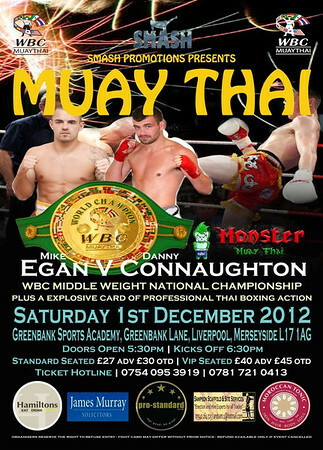 Smash Muay Thai’s December 1st card has wrapped up and the results are in. A Class FTR | Mike Egan (Next Generation) v Danny Connaughton (Lumpinee Crawley): Mike Egan wins by decision. Egan knocked down Connaughton in the 4th round via spinning elbow. With this win Egan becomes the WBC super welterweight National Champion. A Class FTR | Alexis Rufus V Kate Stables : Alexis Rufus wins by decision. From all reports this could have been the fight of the night as both fighters were closely matched and had good exchanges throughout their bout. A Class FTR James Hawksworth (Wigan MT) V Aiden Greenwood (Bradford Thai): The winner on points and new Goldenbelt Champion is James Hawkworth. ~ by fatsoking on December 1, 2012.